Should social work be evidence-based? Health care reform in the United States has promoted policies and practices that are evidence-based. Prevention, diagnoses, and treatment decisions are to be guided by the best available empirical evidence. Decisions about what treatments are to be provided are to be informed by findings of randomized, controlled, research studies when such evidence is available. When more than one treatment option is available, choices are to be based on comparative effectiveness research, which examines the relative costs and benefits of these options. This view of evidence-based policy and practice (EBP) now influences decisions of funders, insurance plans, policy-makers, and individual practitioners. The evidence-based framework now dominates decision-making in the major health and mental health professions in the United States as well as in many other countries. The evidence-based framework is influential not only in health care but also in education, criminal and juvenile justice, international development, and many other discipline and professional practice areas. Yet, this framework has not yet permeated social work professional practice. Should it? In spite of these criticisms, I have been a strong advocate for infusing the EBP framework into social work. This is because I view social work practice, like other health and mental health professions, as accountable to society and to its clients for outcomes that can stand the test of “effectiveness,” as determined by high quality outcomes studies meeting scientific criteria of quality, strength, and relevance. In the early days of the social work profession it may have been true that scientifically-validated intervention methods were not yet available to the profession and, consequently, decisions about how best to help clients necessarily relied on common sense reasoning, authoritative opinion, and tradition. In such circumstances providing a personalized, friendly relationship to those in need was a reasonable and more than likely helpful thing to do. However, thanks to advances in the social and behavioral sciences and intervention research, considerable evidence is now available pointing the way to intervention methods, technologies, and techniques that have specific beneficial effects. These interventions do not negate the importance of the artful use of relationship and interpretation as common, powerful components of any effective social work intervention but, rather, they build upon these components. To be an accountable and ethical profession, social work needs to make use of these interventions for the benefit of its clients and to join the other helping professions in adopting the evidence-based practice framework. Image credit: “Restorative Justice at CivicSummer” by Daniel X. O’Neil. CC BY 2.0 via Flickr. Edward J. Mullen, PhD is the Willma and Albert Musher Professor Emeritus at Columbia University's School of Social Work. He is also Editor in Chief of Oxford Bibliographies in Social Work, one of the first subject areas to launch on the site five years ago. 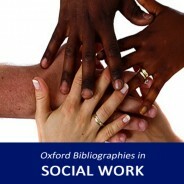 Ed Mullen reflects on 5 years as Editor in Chief of Oxford Bibliographies in Social Work and the future of digital research in a recent video. I’m not sure it’s as explicit as it could be that there is no contradiction between a commitment to positive relationships with clients and EBP. It’s not either/or. Indeed, if we are asked by our clients whether a particular course of action will help, the most reassuring answer is surely based on whether there is evidence at both the general and individual level that it will help, with supportive social work to see it through.